March 2019 was a mixed, but tilting negative month for U.S. dividend paying firms. 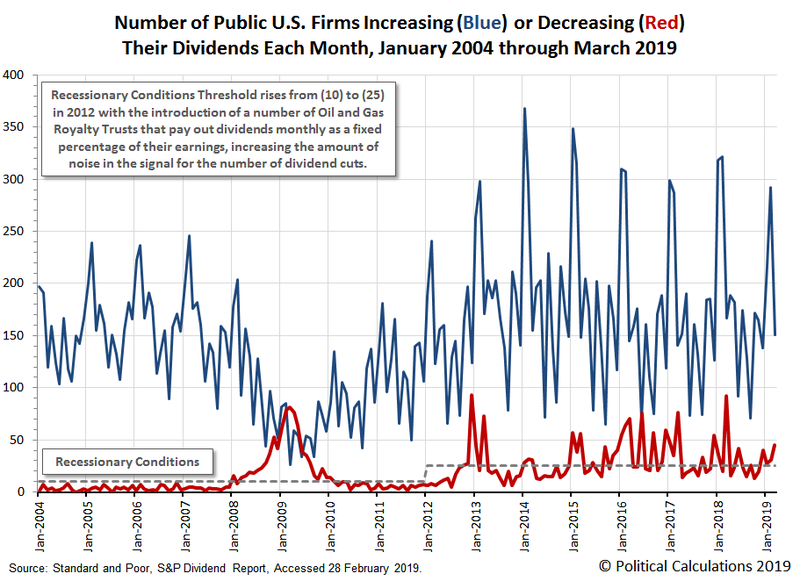 In March 2019, 4,314 U.S. firms declared dividends, an increase of 664 over the 3,650 recorded in February 2019. 31 U.S. firms announced they would pay an extra, or special, dividend to their shareholders in March 2019. March 2019 was a mixed, but tilting negative month for U.S. dividend-paying firms. The month ending the first calendar quarter of 2019 saw fewer companies increase their dividends month-over-month (February 2019) and year-over-year (March 2018), but increased quarter-over-quarter (2018-Q4). At the same time, it also recorded more dividend cuts month-over-month and quarter-over-quarter, but was positive for the year-over-year comparison. But don't take our word for it! Here is our short summary of the official tally as provided for the month by Standard & Poor's. 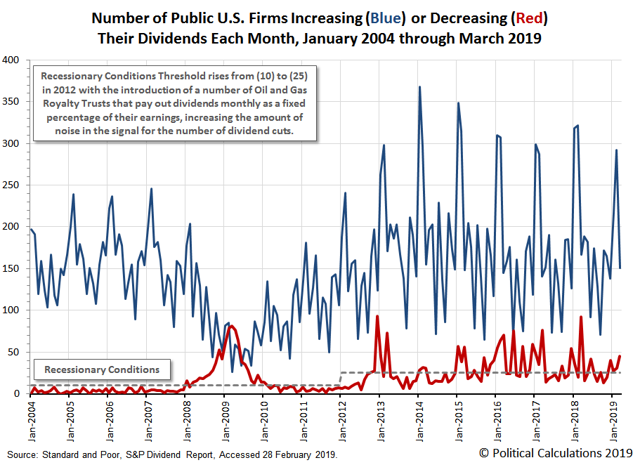 In March 2019, 4,314 U.S. firms declared dividends, an increase of 664 over the 3,650 recorded in February 2019. That figure is also down by 78 from March 2018's year-ago total. 31 U.S. firms announced they would pay an extra, or special, dividend to their shareholders in March 2019, a decrease of 11 from the number recorded in February 2019, and also a decrease of 5 from the total recorded a year earlier in March 2018. A total of 151 U.S. firms announced they would increase their dividend payments to shareholders in March 2019, a decrease of 141 from the number recorded in February 2019, and a decrease of 16 from the 167 dividend rises declared back in March 2018. A total of 45 publicly traded companies cut their dividends in March 2019, an increase of 14 over the number recorded in February 2019, but a decrease of 47 from the 92 recorded in March 2018. Just 2 U.S. firms omitted paying their dividends in March 2019, an increase of 1 over the number recorded in February 2019. That figure is also a decrease of 7 from the number of firms that omitted paying dividends back in March 2018. Increases: 606, down from 475 in 2018-Q4, and also down from 807 in 2018-Q1. Decreases: 103, up from 73 in 2018-Q4, but down from 148 recorded in 2018-Q1. The following chart shows the monthly increases and decreases for dividends as reported by S&P for each month from January 2004 through March 2019. The total number of dividend cuts continues to hold above the level that suggests recessionary conditions are present within the U.S. economy, so we've extracted a sampling of dividend cuts announced in real time during the entire first quarter to get a better sense of which industries are experiencing some degree of distress. In the first portion of this listing, we've focused on firms that set their dividend payments independently of the amounts of their earnings and cash flow, whose corporate boards had to specifically act to either cut or suspend cash dividend payments to their shareholding owners during the first quarter of 2019. In the second portion of our listing of dividend-cutting firms for 2019-Q1, we've focused on firms that pay variable dividends to their shareholders, often as a set percentage of their earnings, revenues, or cash flow. This grouping includes a number of firms that pay dividends monthly, where repeated listings indicate the firms that saw reduced dividends paid out to their shareholders more than once during the quarter. This group contributes much of the month-to-month noise we see for dividend cuts, which we've taken into account in setting the level of dividend cuts associated with recessionary conditions being present in the U.S. economy at the level we do. Overall, we counted a total of 54 dividend cuts in our sampling, which covers a little over half the total dividend cuts recorded by S&P for 2019-Q1. 28 of the reductions in our sample were the result of "active" cuts made by corporate boards responding to negative changes in the outlook for their businesses, where the remaining 26 came about automatically, where the variable dividend-paying firms' diminished revenues, cash flow, or earnings are directly responsible for the reductions in their dividend payments to shareholders during the quarter. The following chart shows the industrial sector for each of our 2019-Q1 sample's dividend cuts, which gives an indication of where business distress was concentrated during the quarter. 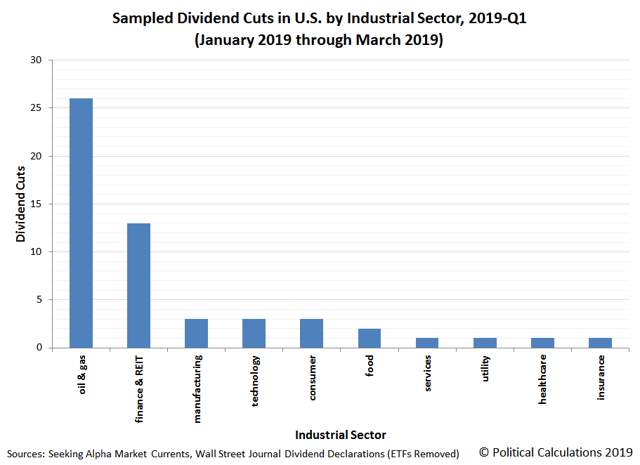 We identified 10 industrial sectors that saw firms declare dividend cuts during 2019-Q1, with just under half accounted for by firms in the oil and gas production sector, where a fall in oil prices in late 2018, early 2019 accounts for the reductions. Meanwhile, the financial sector (in which we've included Real Estate Investment Trusts) accounts for nearly a quarter of our sample, where 2018's rising interest rates caught up to an elevated number of firms in this sector whose earnings are sensitive to changes in these rates. Standard & Poor's. S&P Market Attributes Web File. [Excel Spreadsheet]. 29 March 2019. Seeking Alpha Market Currents. Filtered for Dividends. [Online Database]. Accessed 1 April 2019. Wall Street Journal. Dividend Declarations. [Online Database]. Accessed 1 April 2019.